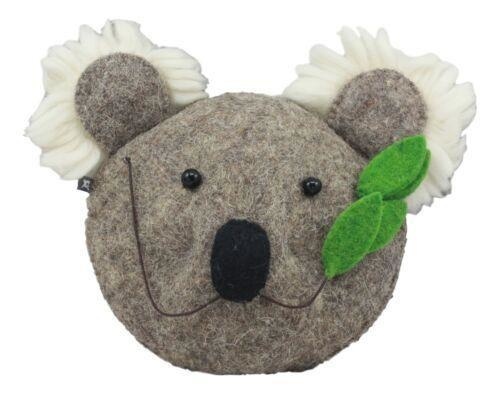 From puppies and rabbits to tigers and hippos, the ever growing Fiona Walker England felt head collection encompasses a variety of friendly faces, fun colors and plush textures which are a great wall decorations for a child's nursery, bedroom or playroom. Imagine all the bedtime stories you can tell with these on your little one’s wall? Each item is hand stitched with love, care and attention meaning that your Fiona Walker England animal is unique so will have its own individual charm. Designed by Fiona Walker in England, and inspired by Scandinavian colors and design, it is eye-catching, memorable, and filled with personality. This Fiona Walker England Animal Head is 100% Wool Felt and is hand made in Jaipur, India, by an all women work force, enabling the women to take their work home so they can take care of their children. They are dyed using recycled water so that dye chemicals are not released into the ecosystem depriving the clean water from the community and are Fairtrade certified. Each head comes with a hook on the back, so it is easily hung. It can easily be hung flush to the wall with a photo hook, or even a nail. Dimensions: H 14", W 11", D 3"